This Sunday bake was actually baked quite a few weeks back but I only got about posting it now as I was waiting for the .com blog to be up. It’s a fairly quick and easy bake – I swapped the plums for pear, as suggested in the recipe, and used oil instead of butter to keep this a no-mixer bake. I eye-balled the ingredients for the streusel and I ended up using too much butter – luckily the bake still turned out well in the end! I love how the pear lends a very crunchy texture to the bake, I don’t think plums will yield the same texture though! Overall I think the cakes could use a stronger cinnamon taste, and would have been better with a scoop of vanilla ice cream! And here’s how to bake them! 1) Measure the ingredients in a bowl. 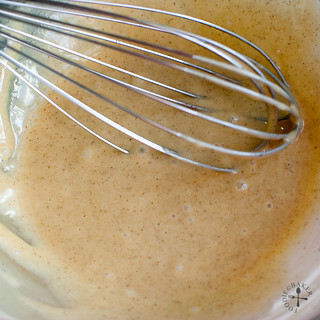 2) Whisk them together. 3) Transfer the batter into a baking tin. 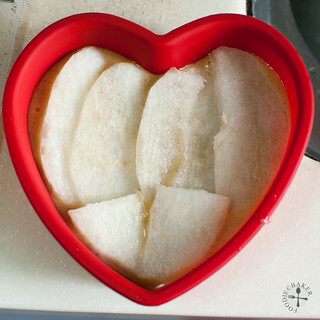 4) Arrange pear slices / cubes on top. 5) Prepare the streusel! 6) Top with streusel and bake away! I’m submitting this to The Home Bakers – do drop by HERE to find out other fellow home bakers’ take on this cake! Our next bake is a Gruyere Brioche Braided – I don’t have much experience in bread baking, so I foresee I’ll be needing a few attempts before I get it right! Do join us in The Home Bakers if you’re interested! Baking Note: As I substituted butter with olive oil, the batter is a bit more watery, so I didn’t use a removable tart tin as I was afraid that the batter will leak during baking. 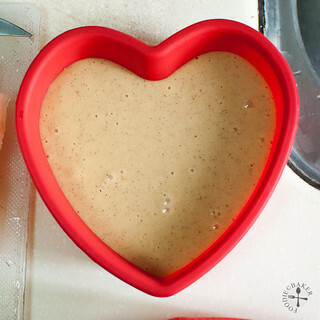 Instead, I used two small heart-shape moulds to fill the batter. For the full instructions, please visit Emily’s – Emily’s Cooking (Makan2) Foray – blog! Makes 1 7-inch cake / 2 5-inch cakes. hi jasline, i’m here again to read about the cake! i am late again for THB bake! i read a few of THB members who had baked this and it seems that all hv diff views on the texture..i might just do it with apricots ..
Hi Kelly, thank you so much for the sweet compliment! I hope you can give the cake a try in the future! Using silicon mold can keep the pan greasing part, isn’t? Thanks for the precious comment to my blog. Just wondering how to participate *the home baker* event? Hi Thea! Yea I didn’t even bother to grease the pan and the cake managed to pop out easily 😉 You will need to get hold of the book that we are using for the bake and contact Joyce, the organizer, and tell her you want to participate! Do head over here: Home Bakers for more details! 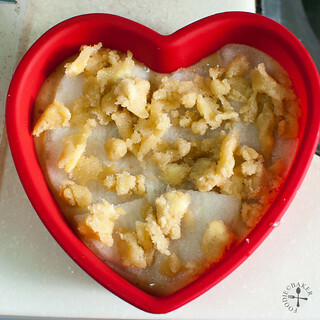 Hi Jasline, thanks for dropping by my blog and leaving a comment, nice to know another blogging friend 🙂 I like that you used pears in this cake, it looks good and best of all sounds simple to make. Hope to visit more often. Nice knowing you too! Yes I love how this is a no-mixer recipe 😉 Hope to see you around too! 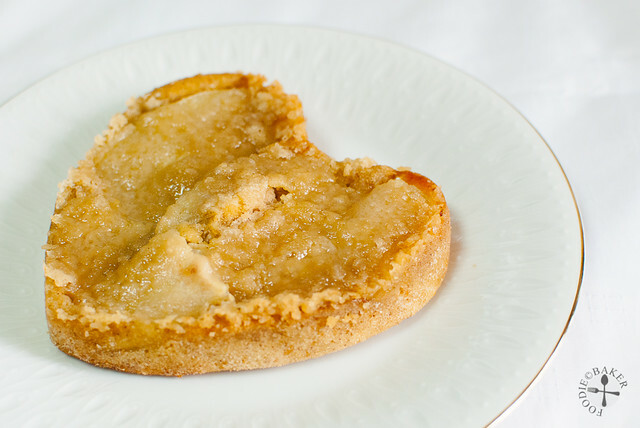 Your Pear Caramel Streusel Cake sounds perfect for afternoon tea. I agree, when I’m taking picture for my blog and rushing to finish to make sure i have enough sunlight, I always go with simple styling! You did a great job in such a rush. 🙂 I would love to try this recipe. I think most every dessert sounds better with a scoop of vanilla ice cream (at least in my world!) This looks delicious…and I love that you did pears instead of plums. Thank you for sharing! Hi Monet! Yes a scoop of ice cream can always make a dessert more delicoius 😉 Thank you for popping by! Wow! Love the look of this cake and so easy to prepare huh! I like the crusty streusel a lot! Your blog looks really nice and fresh! Hi Jeannie! Thank you very much for the compliments! This cake is definitely a to-go when you are in a rush to entertain some guests! Hi Jasline …got to try this cake , it looks so yummy and I too love your mold . 🙂 thanks for stopping by my blog and I will visit often . I like the heart mould and not forgetting the ‘contents’. Have never baked with pear before, would love to try! 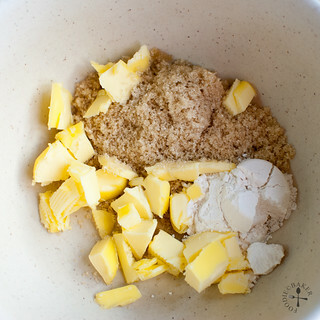 The Choux baking idea sounds awesome…. can anyone join in? Hi Jasline, this cake looks delicious, I love the idea of pear, caramel and the streusel all together in a cake, now I just need a cup o tea to go with it. btw, what kind of pear that suits within the recipe??? Hi there! I used Asian pears, like the one here (http://localfoods.about.com/od/pears/ss/Pear-Varieties_3.htm), which are very crunchy. Any crunchy/crisp pear will work well for this recipe! 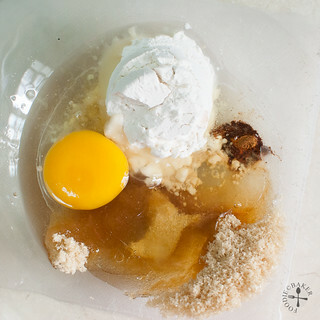 your Pear Caramel Streusel Cake looks delicious! I love using fresh fruit when baking. . The Home Bakers sounds like so much fun. . and omg, will definitely look out for your Gruyere Braided Brioche . . I LOVE homemade bread. . yummmm!!! I couldn’t catch up with this bake too… I was going to bake this recipe with pears too but feel a little flat out at this moment. Yours with pear looks great. Realize that you are organizing choux pastry event next month… Next month is Nigella, egg theme and 2 THB bakes! Ai yo, I’m freaking out now because there is so many things to bake!!! I know, there are so many bakes going around! You forgot to mention there’s another 2 Bake-Alongs! I have already started planning what to bake each weekend, otherwise there’s not enough time to finish baking all! I have a question to ask you about converting your blog to .com. Can you an email? Otherwise, can you email me at zoebakeforhappykids@gmail.com? Hi Zoe, sent you an email! Using pears is a good idea! 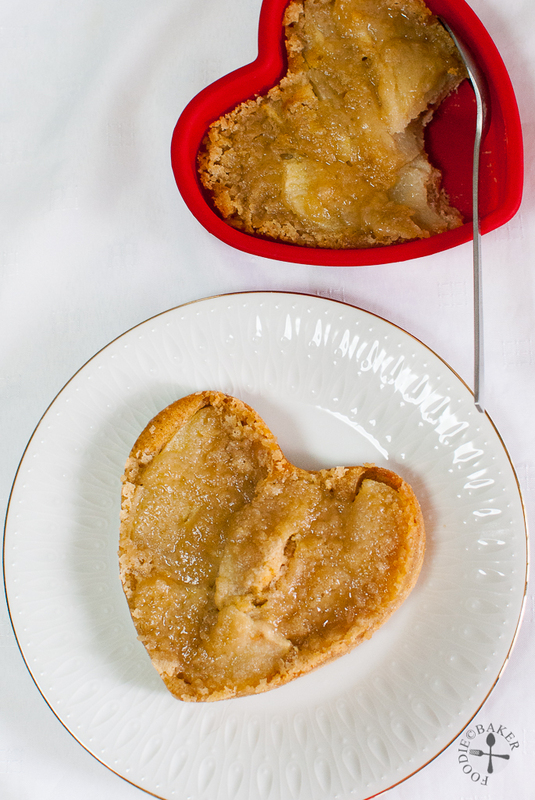 And I like it that you have baked in your cute heart shaped mould, looks very pretty! This dessert sounds really yummy! Such a delightful and refreshing cake, Jasline. I love streusel! I’m so glad you dropped by my blog. I’m sure I will be visiting you again! Hi Louise, thank you very much! I will be visiting yours too, I really love your cute little cupcake cartoons! 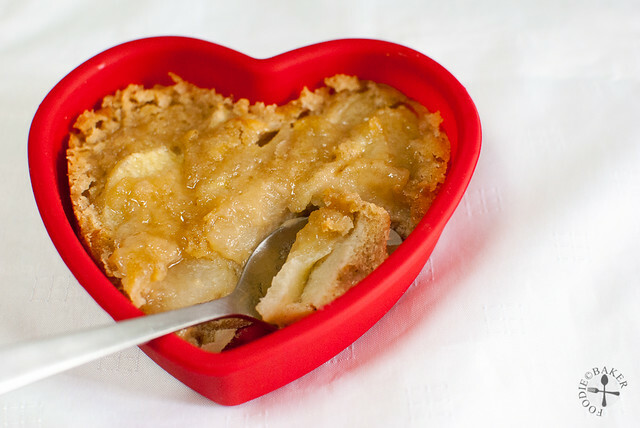 I love the heart-shaped bowl. This looks delicious! Hi Alex! Thank you very much! I love anything with pears in it and this cake looks delicious! Hi Karen, you’re so sweet, thank you! Thank you Laura! I was lazy to cream the butter so I used oil instead, but butter should make the cake even richer! Wonderful that you used pear for our bake. Looks good! Hi Emily, thank you very much! It’s hard to get nice and sweet plums here, so I’m lucky pears worked well!